At around 2:30 p.m., Mom and I started getting hungry. We didn't know what we wanted to eat for lunch, so I decided to grab the phone book and see what was available. Before I could open it, Mom suggested this restaurant - Ugly American- which came highly recommended by my aunt. After looking up their ad in the Yellow Pages, I found their Web address and headed for the computer to look at their menu. The menu at Ugly American is small, but interesting. 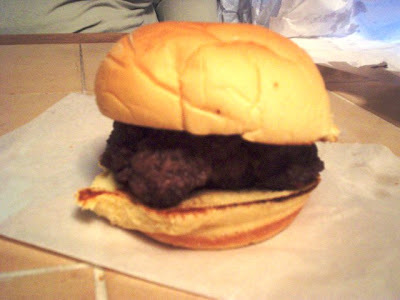 They only use Angus beef to make their handmade burgers, and their hot dogs come with a natural casing. Since burgers were something that Mom had in mind for lunch anyway, she decided to go with that. At 2:50 p.m., I placed the call to Ugly American. A polite gentleman who seemed to be in a rush took my order. I ordered a burger for Mom ($4.37), two ears of grilled sweet corn ($2.35 each), a small box of half fries/half onion straws ($1.99), a jalapeno dog ($1.69), and a bacon cheddar dog ($1.99). The gentleman did not give me a price over the phone, but he did tell me that my order would be ready in about 15 minutes. Impatiently, I started putting on my shoes and tracking down my camera so I could take my undercover pictures of the restaurant. Once inside, there were two customers seated on opposite sides of the dining room. I tried taking pictures, but I didn't want them to spot me with the camera, so I was only able to get a shot of the counter area. There are better pictures available on their Web site. The dining room is very cute and modern. 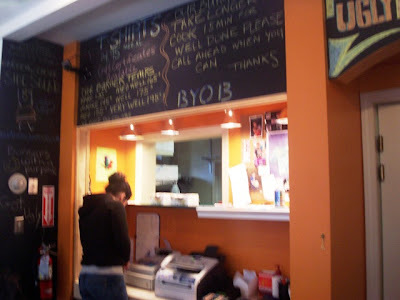 There is a large chalkboard area around the counter that lists various specials and details about the restaurant. There is also a small section with several books on shelves, as well as a few Ugly American T-shirts. When I looked up at the large ceiling fan in the center of the room, I spotted two lighted menus that were being used as light fixtures! What a terrific idea! There were also two large coolers with drinks inside, as well as a small alcove area where diners could go if they wanted some privacy. There are no booths here - only tables - and hanging on one of the walls was a large poster of the movie The Ugly American, starring the late Marlon Brando. Some are walls painted white, while the other walls had something on them which was indistinguishable to me in my short time there. Was it paint? Fabric? Paneling? Who knows, but it was certainly attractive. I was very surprised at how trendy this small restaurant was. I paid the cashier, grabbed a bright orange take-out menu for Mom, and headed for the door. As I drove home, the smell of the food started to fill up the car. Everything smelled so wonderful. I couldn't wait to get home and chow down. Along with their daily list of specials that are written on the chalkboard or advertised on their sidewalk signs, Ugly American has some delicious choices at very low prices. Burgers include the mini burger ($1.47), chicken breast ($4.19), veggie ($3.97) and the Portobello ($3.97). You can add an extra regular topping (red onion, cole slaw, mixed greens, pepperoncini, bread & butter pickles, iceberg lettuce, and tomato) for $.50, and all burgers come with one cheese choice, two regular toppings, and a sauce (buttermilk ranch, honey mustard, vinaigrette, spicy wing sauce, roasted garlic aioli, remoulade, BBQ, Caesar, and blue cheese dressing). 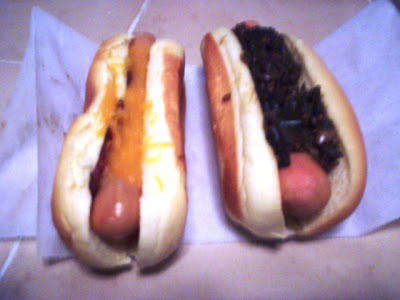 Hot dogs include the plain ($1.35), chili ($2.19), cheese (add $.25), and you can also add an extra regular topping for $.25. Premium toppings are $1 extra for burgers, and $.50 extra for hot dogs. They include avocado, fried egg, hardboiled egg, bacon, grilled asparagus, caramelized onions, sauteed mushrooms, chili, fried onion straws, grilled red onion, roasted jalapenos, roasted peppers, and guacamole. For an appetizer, you can order fries, sweet potato fries, onion straws, and zucchini fries. 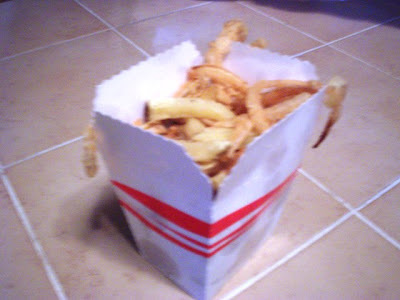 You can order a box of fries/straws (small $1.99, large $2.99) or you can order a 1/2 and 1/2 (small $1.99, large $2.99), where you can choose whatever you want. You can also add chili for $1, or cheese for $.75. Ugly favorites include dishes like The Cheese ($5.29), which is a 7 oz. burger smothered in "a motherload of cheese" with a crispy cheese skirt; the chicken asparagus ($5.29), which is a chicken breast with mozzarella and grilled asparagus; and the mini burger trio ($4.39), which is a plate of three mini burgers with one cheese on each mini - American, Swiss, and Cheddar. 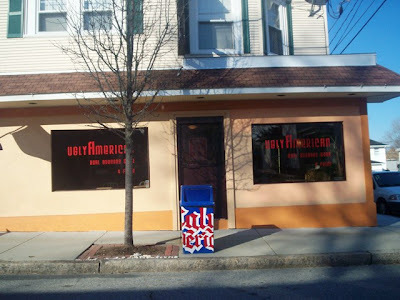 Ugly American also features several salads, sandwiches, and side dishes. When I got home, Mom and I opened the plastic bag containing our lunches. The two hot dogs were in one container, while the burger was in another. The containers were actually custom Ugly American boxes. Nice touch! 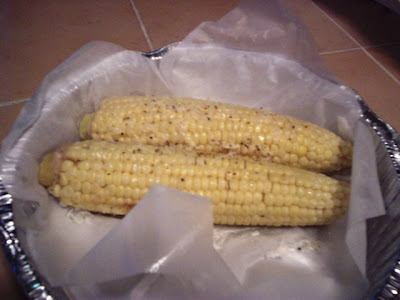 The ears of corn arrived in a covered aluminum cake tin, while the fries and straws came in a small cardboard box. Both Mom and I ate the ears of corn first. Flavored with butter, salt, pepper, and Parmesan cheese, these grilled ears were very tasty. Both ears were cooked well, and we both thought the added cheese was a nice touch. Throughout the meal, both Mom and I snacked on our order of half hand-cut fries, half onion straws. The fries and the onion straws came mixed together which was unusual, but tasty. They were a bit on the wet side, but this may not have anything to do with grease. It may have been because the fries/straws were hot when they went into the bag, and then driven back to my house. They may have just been a little sweaty. Plus, they were sitting on top of the hot ears of corn. Mom's burger was hand-formed, quite thick, and perfectly done. She ordered it medium well and it was cooked exactly right, which is hard to do with a burger that thick. The flavor was great. Mom said it was really tasty. It had a nice charred crunch on the outside, and the inside was moist and delicious. Even the bun was soft and fresh. My hot dogs were very good. They were in the natural casing, which gave them a nice snap, but were not hard to chew (like some casings are). I ate the bacon cheddar dog first, which had a great bacon flavor. The cheese was light and not goopy like some toppings can be. The jalapeno dog had a delicious - and spicy - caramelized jalapeno relish, which I had never had before. It was cool going in, and but once you started to chew, you could really feel the heat. Both buns, like Mom's, were soft and fresh. There are several other dishes that we would like to try from Ugly American. With an interactive Web site, trendy interior, and delicious food, we think that this restaurant is a nice addition to Fall River's dining spots. Both Mom and I hope it stays around for a long time. Ugly American is open from 10:30 a.m. to 8 p.m. Monday through Friday, and 11 a.m. to 8 p.m. on Saturday. They are closed on Sunday.